Wearing a dress you love is such an easy way to get ready for the day. You can make most any dress more formal or more casual, just by changing up your accessories and attitude. This is one of my Karina dresses, the Margaret in royal blue. It’s such a wonderful piece, flowy and easy-fitting, and machine washable. I love the full skirt. Today I felt casual in my Margaret plus a black knit cardigan and silk scarf. My Steve Madden “Troopa” boots are edgy and they’re wearable all day in comfort. I love to wear casual boots with a dress, it seems so rule-defying. The scarf can come off to create a simpler, even more casual any-day look. The new lipstick is “Dominate” (whoa) by Laura Mercier, and my hair is the Wiki by Ellen Wille. I like the simplicity of this version; it fits my current minimalist vibe. I’m out of town and doing my computing via my mobile phone, so I won’t be able to comment on all your fabulous looks. Sorry! I will enjoy every one of them when I get home. I’m sorry I missed out on Visible Monday this week but I’m glad I stopped by your blog to see this great outfit and that dynamic lipstick color! I love the minimalistic look made bold and edgy with a red lip and some lace-up boots. 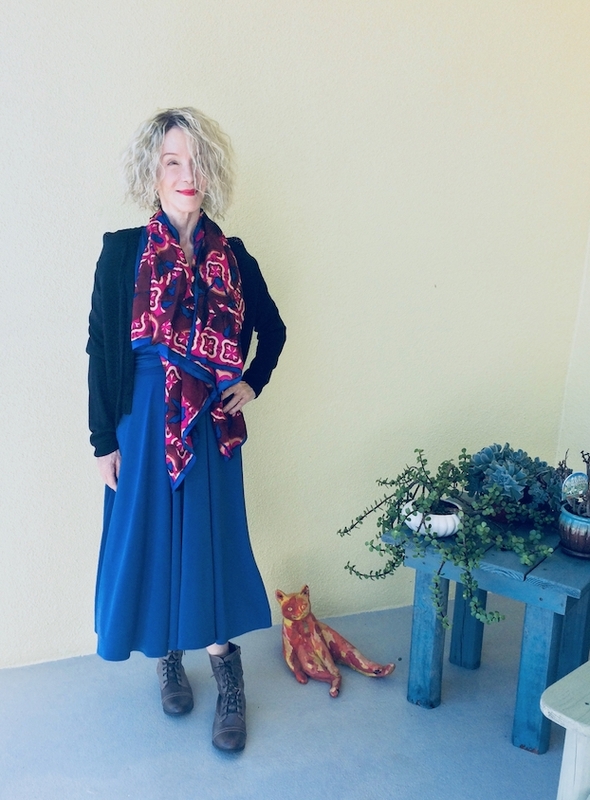 That blue is really great on you, and I love how the scarf makes the colors truly pop! I love the combat boots, flowing dress combo – it is edgy! Great colour on you, that dress. Thanks so much for hosting-with-the-mosting!! Have a great week. Wow! That blue looks amazing on you Patti! And I love the dress with those cool boots! I adore that blue dress on you, Patti – lovely with the scarf, but edgy with the combat-inspired boots. Who doesn’t love to dress up or dress down…a dress!? Thank you so much for hosting “Visible Monday”! I couldn’t agree more about the ease of a dress. I don’t know why it’s taken me this long to realize it. Lots of dresses for this spring and summer for me. Love your navy one! Thank you for hosting your link up! Rule-breaker alert! Hahaha. I love how you do that, the boots with the dress. And the colour of the dress, I’m in love with that. Karina dresses are soooo comfortable. Thanks for the link-up, Patti. I just adore how you mix up your looks with these boots – such a funky way to change a simple dress into a cool look! Thanks for the link up party. Such a lovely dress, the colour looks great on you! I love the scarf too! Dresses and boots are such a fun combination! I like this longer length with the taller boot. 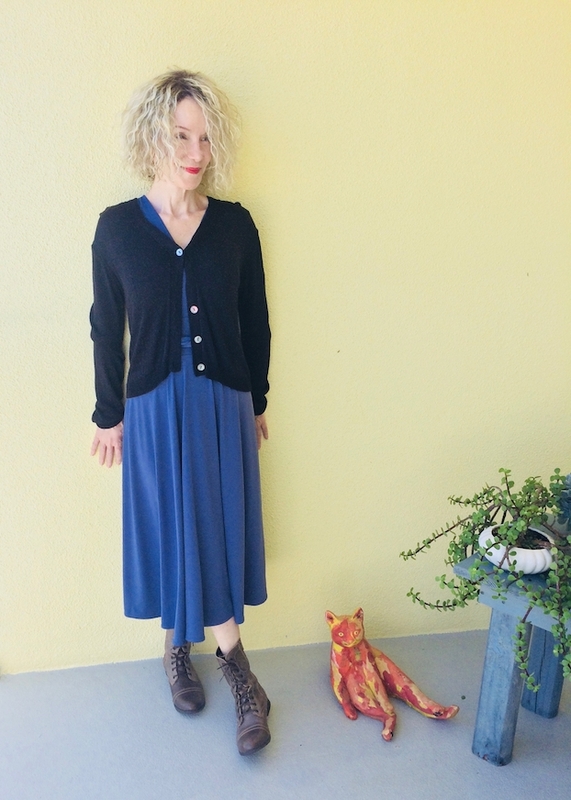 Love blue on you Patti and the Margret looks fab on you! That scarf is such a pretty print on you! Of course I love your fun boots with this look! Have a great week, and I am happy for you finding a place in NY. I love a good versatile dress and yours is fabulous! So many ways to styles it! Happy Monday Patti! So cute! The material looks so comfortable to wear. A dress is the perfect piece to have in your wardrobe: one-stop dressing, it doesn’t get easier than that. And that’s a lovely shade of blue. Patti, I love this! And I have very similar Steve Madden boots except mine have tassels on the toes! I need to pull them out again, I have worn them in years! Thanks for the inspiration…again! what a lovely dress, and I totally agree on wearing casual boots with a dress! You look fabulously comfy&cool! You know I love a pretty dress with a tougher pair of boots…you little rebel rule breaker! Congratulations on the New York purchase, enjoy your dream come true. Looking good in your blue dress and the boots add your own touch. Many thanks for hosting Visible Monday. That is a beautiful colour Patti! Have a great start of the week! You’re face and lipstick is perfect in the 2nd pic! Makes me think of ‘Devil with a Blue Dress On’!!! I hope you’re having a blast! Also love dresses with casual boots, this is a great look, and I love the scarf! Sending hugs to you from not too far away! I love how you styled the dress!! I always think a dress is the way to go!! And you’ve totally proved it here, Patti!! The blue of that dress is so pretty on you Patti!! I hope you are having a blast in NYC in your new place!